A Catholic education was first offered in Prairie du Chien in 1866, through a parochial school at St. Gabriel’s Church. Still, 150 years later, that faith-based light of knowledge has fostered a whole child concept, top-notch academic standards and family values for masses of local students who’ve gone on to become model members of society. Little information is available about the first years of that Catholic education. But, according to a chronological history of St. Gabriel’s and St. John’s churches in Prairie du Chien, the School Sisters of Notre Dame began 120 years of teaching primary school in the city in 1872. St. Mary’s Academy, a girls school under the direction of Catholic nuns, existed in Prairie du Chien from 1870 to 1968. Campion Jesuit High School was founded in 1880, and operated as a boarding school for boys until 1975. It wasn’t until 1902, that St. John’s Parochial School was built. Children of that parish had previously attended what was known as St. Mary’s Parochial School. New schools and convents were built at both St. Gabriel’s and St. John’s parishes in 1960. 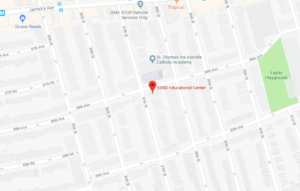 Then, in 1992, the two independent parish grade schools consolidated into Prairie Catholic School, with the elementary section housed at St. Gabriel’s and the middle school at St. John’s. By the 2014-2015 school year, St. John’s School building closed and all students, teachers and staff began attending classes at the St. Gabriel’s location. 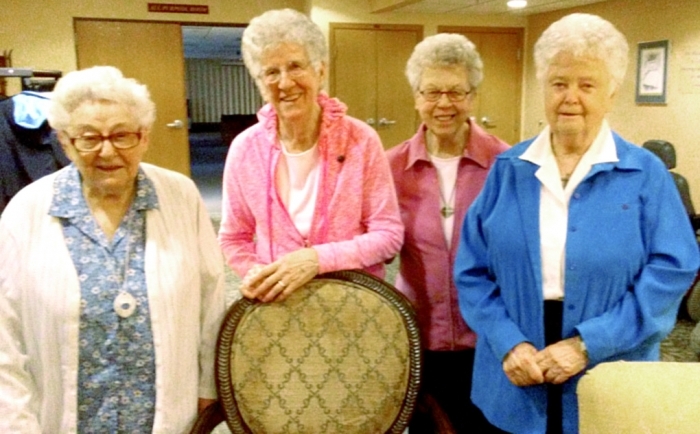 Sisters Angeleen, Therese, Mary Neva and Mary Faith, who are all in their late 80s and early 90s, live at the mother house of the School Sisters of Notre Dame in Elm Grove. Recently, Pat Coorough, a Catholic parishioner from Prairie du Chien, visited the sisters and took this picture. All of these sisters once taught at St. John’s School in Prairie du Chien. The 2016-2017 Prairie Catholic School teachers and staff include (front row, from left) Principal Wade Marlow, Jean Pelleymounter, Michelle Kapfhamer, Mary Huser, Clarissa Russell, Jenni Nack, Mike Wallace; (back row) Connie Lessard, Joahn Post, Julie Schwager, Jennifer Wachuta, Lori Hemmer, Kathy Igou, Rachel Felten, Luana Stiemke, William Huser, Janet Steiner and Judy Gillitzer. Recently, the Courier Press coordinated a phone interview with four former nuns who taught St. John’s students in Prairie du Chien in the 1960s and ‘70s. They all reside among the mother house of the School Sisters of Notre Dame in Elm Grove. In Prairie du Chien, Sister Angeleen Brill taught first grade from 1964 to 1976. Sister Mary Faith Parkinson taught and served as teacher and principal from 1965 to 1971. Sister Therese Rekowski, teacher and religious education coordinator, led students from 1967 to 1974. Sister Mary Neva Landreck taught seventh and eighth grades and served as principal from 1971 to 1978. They all agreed the students from Prairie du Chien were “really a nice bunch of kids,” and their parents were consistent in that “cooperative” character. Fifty years ago, the nuns taught every subject, from religion and math to music and art. They didn’t have specialty classes for extracurriculars, like the Catholic school does now. The only time they got a break was when an extra priest came into their classroom and allowed them a half-hour to themselves. “There was some switching back and forth (of the kids in classrooms) if a teacher wasn’t as confident in a certain subject,” Sister Therese said. “There were no computers, just books,” Sister Angeleen added. In those days, they had liturgy every day and all students participated, even at the elementary level. Sister Mary Faith said St. Gabriel’s and St. John’s were blessed on the same day. St. John’s parishioners and students were mainly Bohemian and St. Gabriel’s parishioners and students were predominantly Irish. Catechism was taught on Monday nights for public schools and there were no sporting activities on those evenings to conflict with such a religious priority. During their time in Prairie du Chien, Catholic education transitioned from the Baltimore catechism style of teaching, which utilized a question-and-answer format with illustrations explaining complex ideas, to the entirely different, after-Vatican style that was more open with the scripture and benefitted from the practice of physically acting out the Gospel. The sisters didn’t even have a car. So they walked downtown to get groceries and, basically, hoped a parishioner would stop and pick them up on their way back to the convent. Whenever they needed to go to their hometown, which was rarely, they had to find a ride. The women reflected about taking walks in their spare time and enjoying Wyalusing Park, Pike’s Peak and the local playground areas. When asked about Pete’s Hamburger Stand, they had fond memories of such flavors as well. The nuns primarily remember the students and parents most. Some of the large families the four sisters taught included the Garritys, Lochners and Maras. Since they left Prairie du Chien, the sisters haven’t kept in touch with too many community members. They were, in fact, not encouraged to do so, but to move on to their next order. Sister Angeleen said she writes letters to a few people from Prairie du Chien now and then. Plus, they’ve all had visitors from the area on occasion. Though times have changed since the sisters left, striving to educate the mind, body and soul continues as the emphasis for Catholic teachers to this day. A decade or so after they left the community, a new crop of educators started their careers in Prairie du Chien. Current teachers Lori Hemmer, Jenny Wachuta and Mary Huser sat down to talk about their past three and a half decades at the helm of Prairie Catholic’s classrooms. Hemmer has been teaching for 35 years, instructs first graders presently and started at St. John’s School, which happens to be the same place she went to school. Wachuta teaches third grade and started working 34 years ago. She’s always been at St. Gabriel’s School. Huser leads kindergarten students and has been a teacher for 34 years. She also began at St. John’s. Each of these women is proud to be part of the faith-based, quality education Prairie Catholic offers. They see their small class sizes as advantageous, they hold their students to high expectations and they appreciate the great parental involvement they have on a consistent basis. They’ve taught many large families themselves, including lots of cousins like the Steiners, Nolans, Stegers, Gillitzers, Osterhauses, Becwars, etc. “We have many, many students who go on to seek higher education and great professions,” Huser added. Prairie Catholic students are respectful, responsible, engaging, resourceful and, most of all, faithful. Though students don’t have to be Catholic to attend classes, they are versed in religion weekly and they participate in masses. Prairie Catholic doesn’t have the same amount of funding that public schools have, but the teachers said its parishioners are supportive and give generously what they can afford. Nevertheless, Huser pointed out, she and her colleagues are each state-licensed teachers and keep current on their continuing education requirements. “That’s just one of the misconceptions I think people have of [our school],” she said. Additionally, Hemmer said, the Saints have a strong sports program and band. They also have modern technology, teacher’s aides, tuition assistance, consumer fundraising, and they collaborate with the public school for bus transportation. Just as those who came before them, teaching Catholic education is like a calling, Wachuta said. The school has a more visible presence in the community today and instructors may not be as strict as their earlier counterparts. But they have the same holistic approach to raising the academic, social, emotional, physical and spiritual development of every single student who walks through Prairie Catholic’s doors. Perhaps another 150 years of Catholic education is part of the school’s next chapter.